Hi, blog readers. It is 5:30 and I came home around 3 to avoid the impending doom of the 12-20 inches of snow. (or is it 20-30? It seems to change by the minute). I picked up the "Snowpocalypse" term from another blog somewhere and it seems to be apt. I chose that term over other ones with equal appeal such as "Snowgasm" and "Snowmageddon." Don't believe me? 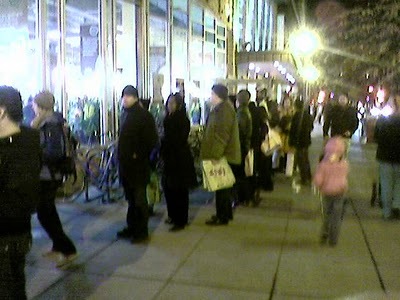 Check out the yuppies/hipsters at the DC Whole Foods last night, waiting in line outside the store, as reported by local blog 14th & You. DC is so crazy. The December snow storm didn't seem to cause as much craziness. Needless to say, I know from past experience that it's about this time of the evening that I tell myself that "I'll get to that work later this weekend" and then never do. Oh well. Hmm, let me check that inventory again and see what's for dinner! Ha--Kim, it seems one can add "liquor" to the typical "milk, bread, toilet paper" snow stock up list from what I'm seeing on facebook! Wow. That line is ridiculous. I know--can you believe it? I guess the store was closing early...but, wouldn't you just say "Oh, I'll just leave." Not these people! Though I heard the Safeway was similarly crowded. I'd have to have very very little food in my house to deal with this!